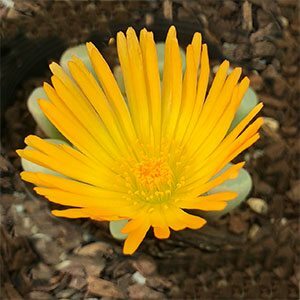 A dwarf succulent from Southern Africa Fenestraria aurantiaca is commonly called Baby Toes. With an unusual growth habit, the individual leaves have a rounded stem and a flattened top. These leaves appear as small clumps and are attached to a fleshy root structure. The mass of flattened green tops is attractive and the yellow daisy like flowers are large for the size of the plant itself. This is a succulent that requires a dry summer and a wet winter, good drainage year round is essential. Mostly grown in containers this is an excellent little succulent to grow indoors on a windowsill. In its natural habitat it grows in part shade and this needs to be replicated in cultivation. Morning sun and afternoon shade is ideal. If grown indoors, then good filtered light is best. Propagation is easy by division of established clumps, this is best carried out in late winter to spring. Also possible from seed although germination is slow. 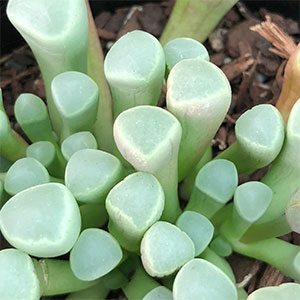 Common Name – ‘Baby Toes’. Soil – Say and well drained. Spread – To around 12 cm plus. Frost tolerant – Light frosts only, splitting can occur in frosts.